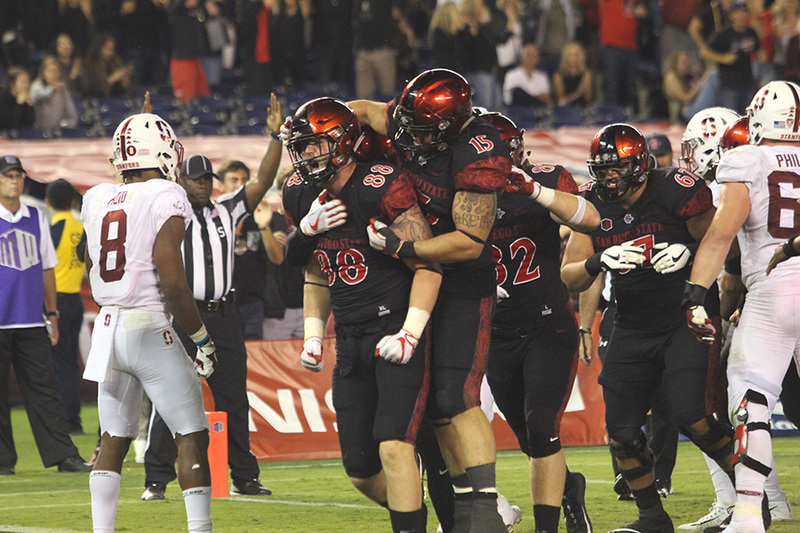 SDSU players David Wells, Nick Bawden, Antonio Rosales and Parker Houston celebrate after Wells' game-winning touchdown catch against Stanford. Saturday night was the best win in the history of San Diego State football, as the Aztecs beat No. 19 Stanford, 20-17. All 43,040 fans in attendance most likely woke up the next day without their voices, as they had the stadium sounding louder than it ever had before. 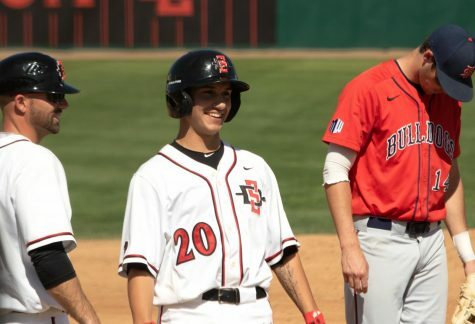 Some may even say the noise caused the now infamous power outage, but that might just be SDSU folklore. The Aztecs were given a 15 percent chance to win, according to ESPN’s Football Power Index, and ended the game with a last-minute touchdown, field storming, emotional fans and awe-struck players. On the biggest stage, the Aztecs shocked the college football world. How does a Mountain West Conference team that hasn’t defeated a ranked power five program since 1981 beat a perennial Pac-12 powerhouse? To those still asking that question, it’s time to stop sleeping on the two-time defending MWC championships. Senior safety Kameron Kelly, who had six tackles in the game to go with two sacks an interception and forced fumble, said he is used to being counted out. 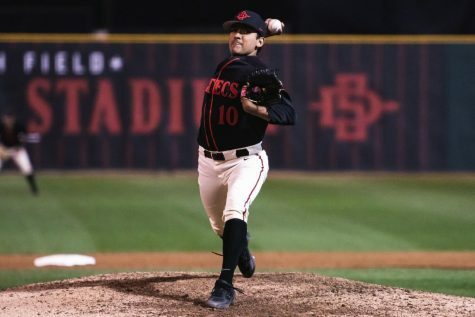 This is SDSU’s third straight win against a Pac-12 team, including a dominant road win over Arizona State University last weekend. 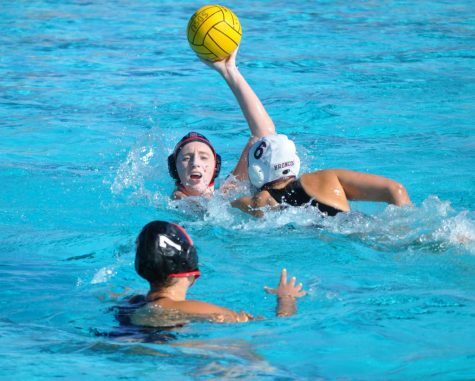 Turnovers killed the Cardinal, and the Aztecs capitalized on their mistakes. Redshirt junior quarterback Christian Chapman and senior running back Rashaad Penny led the way on offense, and the defense played lights out for most of the game to give SDSU a chance to win. 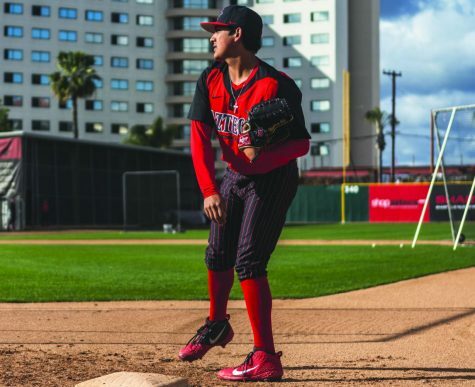 One of the biggest improvements for the Aztecs was Chapman’s play. Chapman showed that he is not merely a game manager, having the best game of his career against an outstanding defense. Chapman completed 21 of 29 passes for 187 yards and a touchdown against Stanford, more than doubling his passing numbers from his last game against Arizona State, when he completed only 9 of 18 passes for 73 yards. Chapman also led a late 75-yard touchdown drive topped off by an 8-yard game winning touchdown pass to senior tight end David Wells. Senior wide receiver Mikah Holder, who caught a team -leading seven catches for 85 yards in the game, had high praise for his quarterback. SDSU head coach Rocky Long, who has always been one of Chapman’s harshest critics, was also impressed with his signal caller’s performance. For most of the country the victory comes as a surprise, and many outsiders may attribute the loss to poor play by Stanford, but for the Scarlet and Black faithful this game showed what SDSU football is all about. 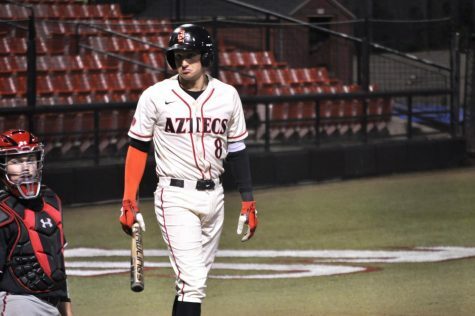 The Aztecs head into this weekend’s game against Air Force ranked No. 22 in the AP Poll and No. 25 in the Amway Coaches Poll, which brings with it a target on their back. 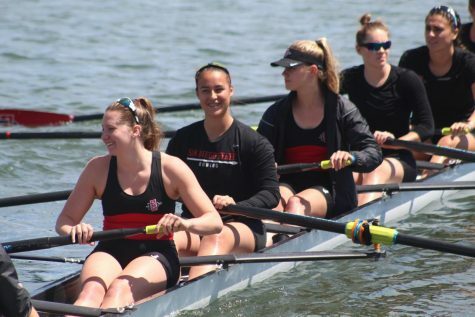 SDSU hasn’t won a game as a ranked team since the 1980’s, and the team faltered last year after being ranked No. 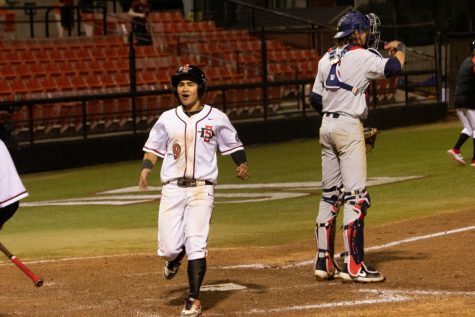 19, losing on the road to Southern Alabama after starting the season 3-0. 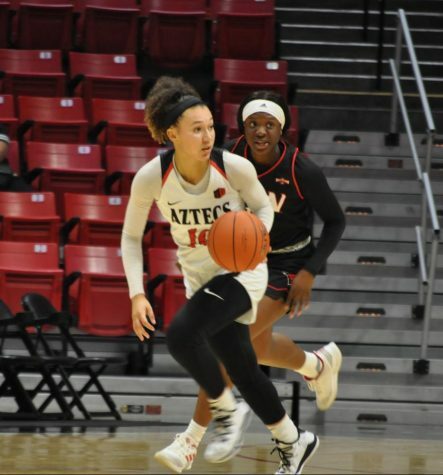 SDSU will attempt to perform better as a ranked team this season, with their first big test coming on Saturday when it travels to Air Force to take on their MWC foe. If this last weekend was any indication, it will be a long game for the Falcons.